This view from the Canada-France-Hawaii Telescope shows a close-up of the sky around a very unusual green object called J224024.1−092748 or J2240. 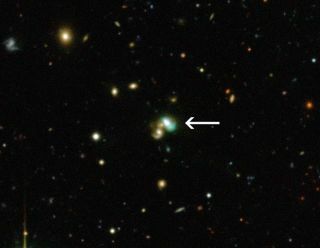 It is a bright example of a new class of objects that have been nicknamed green bean galaxies. Image released Dec. 5, 2012. Astronomers found a green jellybean in space that you'd never want to swallow. The galaxy represents a new type, and falls within the range of active galaxies known as Seyfert galaxies. It glows green because of X-rays spewing from a gigantic black hole at its center that weighs several million to billion times more than the sun. Dubbed a "green bean" galaxy, it appears to be quite rare. Scientists found only about 20 green beans in the vast swath of sky surveyed for this research. "These things are light echoes," said Mischa Schirmer, the lead researcher of a paper reporting the findings released today (Dec. 5) and accepted for publication in the Astrophysical Journal. "What we see is a quasar that is shutting down," Schirmer said. "It hasn't shut down entirely yet." Schirmer, a Gemini Observatory astronomer, usually trolls for galaxy clusters in his research. While examining a large image based on data from the Canada-France-Hawaii Telescope, he spotted a green galaxy nestled among the usual blue and yellow ones. At first, he thought it might be a type of galaxy that glows because of star birth. After getting some time behind ESO's Very Large Telescope to examine the galaxy's spectrum of light, however, he realized something different was at play: the glow came from black holes. Black holes living in galaxies tend to swell as gas and stars fall in. As the black hole swallows mass, it releases energy in the form of X-ray radiation. "The photons, they ionize the gas in the surrounding black hole," Schirmer said. "The entire galaxy was glowing, or fluorescing." These glowing areas, more properly known as "narrow line regions," usually are only 1,000 to 10,000 light years in diameter, or about 1 to 10 percent of a typical galactic diameter. In this case, Schirmer realized the black hole in this galaxy had to be extremely powerful. His team pulled data from the Sloan Digital Sky Survey, an online database of 900 million galaxies, in search of objects with a similar size and color. "I only found about 20 more in an area [that is] a third of the entire sky. It's a really rare object," Schirmer said. Schirmer made further observations to determine these galaxies' distance and light characteristics. Then, his team pulled out data from the Wide-field Infrared Survey Explorer(WISE) space telescope to peer behind the dust obscuring the area around the black holes. Comparing his green beans to other types of active galaxies with black holes, Schirmer discovered the green beans emission of mid-infrared light is five to 50 times brighter than expected. "I'm seeing a light echo, an ionization echo," Schirmer said. "This glowing region reflects a much more active, earlier state of the black hole than it is right now." The discovery raises the possibility of several new lines of research, he added. Astronomers do not yet know how a supermassive black hole shuts down, or how long it takes. Schirmer said the green bean stage of a galaxy's life is probably brief. He is focusing right now on how quasar luminosity changes over tens of thousands of years. This process is linked to the green bean phenomenon, but how and why remain unanswered questions. "From [observations of quasars], we can test our models," he said. "These observations help the astronomers to test theoretical models on timescales that were previously not accessible."